JK wonders wtf they have a supposidly Justice system for As we know I have spent the past 5years oh and a hell of a lot longer (through no fault of my own) stuck and trying to move on spent 2 years at college started university and decided the course wasnt for me, I then do some Volunteering for a year and eventually with some fight get a job!! In this time all my cars have been legal Jk attended her interview a couple of months ago for Paisley Uni to attend Social Work course the interview went great and they were mostly impressed that I voiced my own opinions and not that of the system I was asked about my convictions and declared all next day I called from work and faxed a copy of my enhanced disclosure infact it was criminal justice who faxed it!! Anyway eventually got rejected as per But decided this time i wanted feedback as to why? the interview going so well made me wonder. I got a letter giving me unconditional acceptance into social science and waited on this feedback. Low and behold Kano being off today decides to check the house phone and there`s a message from professor !! Telling me the reason i didnt get a place is that..........They felt I wasnt being completely honest in disclosing my convictions. Now if you dont want me on the course just tell me dont accuse me of lying!!! JK is sooooooooo f*****g upset and angry this morning I have called but shes not in, there is no way on earth can I leave this the place on the course they can shove....you know where!! It does however make you wonder why keep fighting they just keep putting the boot in....wrongly accused AGAIN!!! Him : Oh you qualify for winning women award!! That means first modules free. Him : Last question do you have any criminal convictions? Him: Yes but any you have disclose? Him : Dont think i really want to know....hahaha Ill process this through today and we will get you down to class. Noo watch this space if a disclosure has to be done guarenteed they will look at disposal and not offence!!! Very sorry to hear about your recent plight JK. Perhaps they are using it as an excuse as a smokescreen to keep you out. They tend to let the great brainwashed into their lair before the mentally active! Think you were right there H6 got a call back from them today she repeated what was said on the answering machine. So I pointed out that they had a full disclosure faxed to them she said she understood this now but still felt i wasnt being totally honest......and then it came "oh there was something else actually we felt you didnt show enough remorse regarding your offences"....( I need to check that again must be something there im missing )So i came straight out and asked if its the fact i have any offences at all thats stopping me? she replied if it was engineering or something but we do have to be very careful who we let in to social work the conversation then changed totally and she advised me to check if there were any places left in other uni`s for social work this year if not she would strongly advise me to re-apply next year (that`ll be when its spent ) or do social science with them and convert to social work after that. Amazing how they squirm when asked directly. JK isnt sure what shes going to do work wise but it is coming close to me moving on but ill never stop having a say in how badly the system lets people down. A pilot project which is already having an impact in helping to reduce reoffending, increase employment and strengthen family networks is to be rolled out across every prison in Scotland as the Big Lottery Fund today announces a £2 million award to the Wise Group for the Routes out of Prison (RooP) project. The RooP project will work with 4,746 short term prisoners over the next two and half years helping them to integrate back into their communities and to stop the revolving door back into prison. Research shows that employment is a key component to reducing re-offending. Through the ROOP project 782 of these 4,746 offenders are expected to access employment or training opportunities. The project will also aim to achieve a reduction in re-offending rates between two per cent and five per cent by December 2010. Employed by the Wise Group, these ex-offenders will establish a trusting relationship and plan of action to help short term offenders settle back into their community. This can involve meeting the individual at the prison gates and then accompanying them to the housing department, benefits agency, FE college or other support agency. Following their release many of the offenders will also work with a Job Developer who will identify and help them to progress onto training or employment with the support of the Wise Group - a social enterprise that works with others to build stronger communities and increase job opportunities for individuals. During the RooP pilot project the Wise Group engaged with 1565 clients pre-release from Barlinnie and Cornton Vale prisons and Polmont Young Offenders Institution. Since August 2006, 798 of these offenders had at least one engagement with a Wise Group employee on release. Of these 798, 151 secured either a job or a training place. This equates to 18.9 per cent over 19 months. The pilot also showed that over 55 per cent of participants continued with support from a Wise Group employee after their release and at least 70 per cent engaged with the community support agencies they were sign-posted to. Research also indicates that families are often one of the most critical factors in whether a prisoner re-offends. Prisoners without family support are two to six times more likely to re-offend in the first year after release. The imprisonment of a relative also has a significant impact on their family. There can be risk to housing tenure; financial pressures; anxiety, distress and health problems; rejection and stigma by neighbours and the community; and problems in caring for children. Today’s Big Lottery Fund award will also enable RooP to pilot a family relationship programme with 100 offenders pre-release who will be supported to re-establish and develop their relationships with their families. Laurie Russell, Chief Executive of the Wise Group, said: “The Routes out of Prison project will now be able to make a significant contribution to support more short-term prisoners make the successful transition from prison back into the community and to sustainable employment. Today’s award has been made through Big Lottery Fund’s Life Transitions programme which supports people at times of change in their lives – at different life stages and in different circumstances. The Routes out of Prison partnership consists of: the Wise Group, Scottish Prison Service, Apex Scotland, Families Outside, Criminal Justice Social Work Service for Scotland and the Criminal Justice Areas in Scotland. Additional financial support has been received from the European Social Fund and Glasgow City Council. Just heard about this today and Kilmarnock prison yesterday decided to allow an ex-offender access to the prison So big shock there as even though the volunteers were helping people they wouldnt allow offenders in for a pre-release interview. 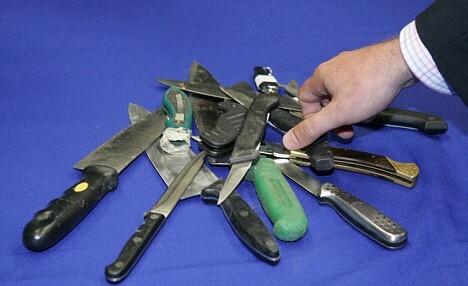 Juveniles who carry a knife unlawfully will be ranked alongside child murderers and rapists under new police rules. The move will remove the leeway given to officers to let off offenders with a reprimand or warning. The crime of carrying a bladed article will be placed in a category of "excluded offences" for which culprits are automatically charged. Other offences in this category include kidnap, arson, poisoning and causing death by dangerous driving. The change will form the centrepiece of the Government's response to pressure for tougher action against those who carry blades. It follows concern that 90 per cent of teenagers were being allowed to escape prosecution with a reprimand. The main reason for this was official guidance attached to the Crime and Disorder Act 2000, introduced by Justice Secretary Jack Straw when he was home secretary. This attached a "gravity weighting" to different offences, dictating how the police should proceed in each case. It meant officers were bound to issue a reprimand or warning to juvenile knife carriers unless there were aggravating circumstances, such as using the weapon to carry out a robbery. The aim was to reduce the likelihood of juveniles being brought into the justice and prisons system, in case that led them into further criminality. Now Gordon Brown has ordered a reversal of this approach after last week's Downing Street summit on knife crime with police chiefs, ministers and the Director of Public Prosecutions. As a result, the low weighting attached to carrying a knife will be removed, and the offence put on the list of those that must be prosecuted. The aim is to ensure all offenders are brought before the courts, so they can be punished effectively and action taken to address the causes of criminal behaviour. At the same time, a tougher approach will be taken towards adults arrested for possessing an offensive weapon. Prosecutors have been given guidelines instructing them that there should be a "presumption" to charge - effectively telling them to prosecute. An outright order to prosecute automatically would be illegal and subject to judicial challenge, as the Crown Prosecution Service has a legal requirement to exercise discretion in each case. The new measures do not alter the defence available to both juveniles and adults, who can show they were carrying a blade for a lawful reason. This could include anglers found with a fishing knife, workers carrying their tools to a job or people returning from a shop with a new kitchen knife. It is only a crime to carry a blade "without lawful reason" and that is unchanged.